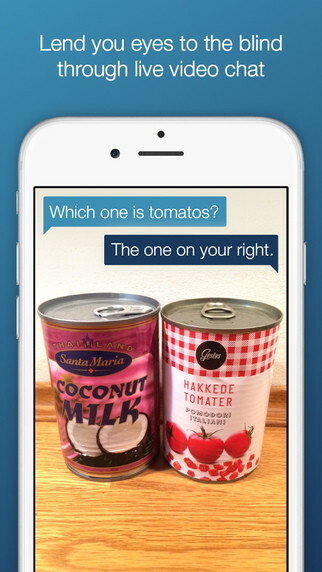 A new app lets you -- yes, you -- help the blind see. Copenhagen-based app Be My Eyes, which launched on Thursday, connects blind people and sighted people through their iPhones and iPads. Here's how it works: If you're blind, you can sign up for the service and reach out to sighted users through a live video connection on the app. Once connected, blind users can ask sighted users questions over video chat. If you're sighted, you can sign up to help blind users. If you're a sighted user and you get a request, it will come through your phone as a push notification with a ringing sound. If you tap the notification, you'll be connected and a video will pop up, showing whatever the blind user is filming. You'll also be able to hear him or her speak and ask a question. iPhones and iPads have services built in to help blind users. You can use VoiceOver for iOS to get your iPhone or iPad to help you navigate your screen, type, read, use apps and more. Since you're connected to each other via live video, there are obviously some ways in which users could abuse the system. "Both the blind person and the sighted person are allowed to report each other for misuse," Be My Eyes co-founder and CEO Thelle Kristensen told The Huffington Post in a phone interview on Friday. If you get reported enough times, you won't be able to connect to anyone through the app anymore. If you're a sighted user and a notification appears but you don't answer it, the request will simply go to someone else. As of now, there are currently more than 17,800 sighted people and 1,500 blind people using the app, according to the Be My Eyes website. More than 2,900 pairs of blind and sighted people have been connected so far. "Not every helper has gotten a call yet," Kristensen said. "We hope to see that picking up more and more." The entire service is free, and Be My Eyes is a nonprofit. It's only available on iOS devices for now, but you can request to be notified when the Android app is available.